SOS Online Backup is an Infrascale company. Founded in 2001 by Ken Shaw, Infrascale has its headquarters in El Segundo, CA, USA. It has eleven data centers in total, located in Los Angeles, CA; three in Dallas, TX; two in Houston, TX; Louisville, KY; Toronto, Ontario Canada; London, England; Johannesburg, South Africa; and Melbourne, Australia. It has office locations in Los Angeles, CA; Athens, Greece; Kiev, Ukraine; Chennai, India; and Sydney, Australia. SOS Online Backup comes with a 30 day money back guarantee, but does not offer a free trial. They take major credit cards and PayPal. Yearly plans are prepaid. 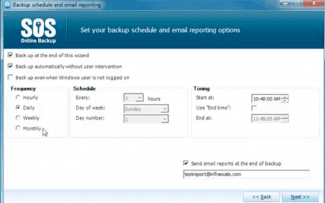 When setting up, SOS will find important files automatically and set a schedule. 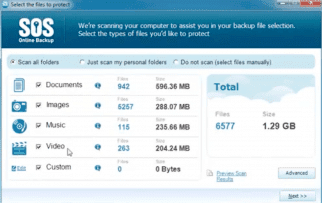 File backup is based on file type, including either common or custom file types. Can manually back up any file. Personal Cloud 1, $7.99/mo no contract, $79.99 1 year prepay, $139.99 2 year prepay: Infinite storage for one home PC or Mac and unlimited mobile devices. Personal Cloud 5, $39.95/mo no contract, $399.95 1 year prepay, $699.95 2 year prepay: Infinite storage for up to five home PCs or Macs and unlimited mobile devices. 10 GB, $9.99/mo no contract, $99.99 1 year prepay, $179.00 2 year prepay: Centralized management; unlimited PC and Mac Backup; unlimited Android & iOS Backup; ForeverSave archive & version history; NAS backup; external storage backup. 25 GB, $24.99/mo no contract, $249.99 1 year prepay, $449.99 2 year prepay: Centralized management; unlimited PC and Mac Backup; unlimited Android & iOS Backup; ForeverSave archive & version history; NAS backup; external storage backup. 50 GB, $39.99/mo no contract, $399.99 1 year prepay, $719.99 2 year prepay: Centralized management; unlimited PC and Mac Backup; unlimited Android & iOS Backup; ForeverSave archive & version history; NAS backup; external storage backup. 100 GB, $69.99/mo no contract, $699.99 1 year prepay, $1,259.99 2 year prepay: Centralized management; unlimited PC and Mac Backup; unlimited Android & iOS Backup; ForeverSave archive & version history; NAS backup; external storage backup. 250 GB, $149.99/mo no contract, $1,499.99 1 year prepay, $2,699.99 2 year prepay: Centralized management; unlimited PC and Mac Backup; unlimited Android & iOS Backup; ForeverSave archive & version history; NAS backup; external storage backup. 500 GB, $249.99/mo no contract, $2,499.99 1 year prepay, $4,499.99 2 year prepay: Centralized management; unlimited PC and Mac Backup; unlimited Android & iOS Backup; ForeverSave archive & version history; NAS backup; external storage backup. 1 TB, $399.99/mo co contract, $3,999.99 1 year prepay $7,199.99 2 year prepay: Centralized management; unlimited PC and Mac Backup; unlimited Android & iOS Backup; ForeverSave archive & version history; NAS backup; external storage backup. SOS runs quietly and automatically in the background on PC, Mac, and Android, but iPhones and iPads must be backed up manually. It can protect USB, FireWire, Thunderbolt, and eSATA drives, and network-attached storage from any PC, Mac or Linux computer. SOS owns all their own data centers. Many competitors partner with service providers, like Amazon and Google, but SOS keeps it all in house. Their twelve data centers are spread throughout the world on five continents. Data on each server is redundantly backed up to a secondary server daily. SOS UltraSafe is HIPAA certified for medical data, and compliant with Securities and Exchange Commission, Sarbanes-Oxley, also known as SOX, for financial data. The data is encrypted locally, encrypted during transit using SSL, then encrypted a third time within SOS’s servers. With UltraSafe MAX, the encryption keys are not stored on SOS servers; the data will be so secure that if you lose your password it cannot be recovered. 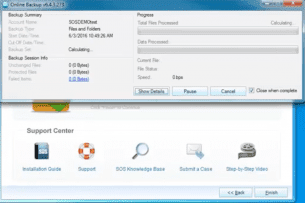 SOS is a good service to look into if you have sensitive data that needs to be backed up. 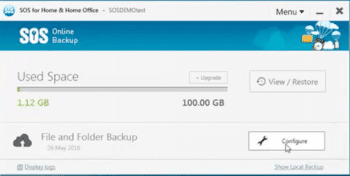 What Do You Think of SOS Online Backup?